This is BIG!!! We’re downright excited about what we’re sharing with you today…. It’s our very first video creation, and its message is at the heart of what we do! 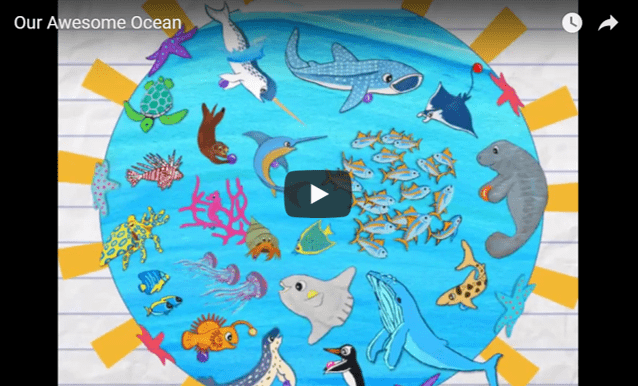 A while back, we created an ocean infographic to help spread the word about how awesome the ocean is! Our goal was (and is) to help bring light to something that needs to be heard everywhere: We all need our ocean and our ocean needs us! The ocean is as vital as the oxygen we breathe and the food we eat (and a big part of both of those things too). In addition to spreading the word about ocean conservation, we hope to help people grab hold of it and take meaningful action — because all of our actions truly do make a difference. So, we’ve taken it to the next level and created a fun, short video that can be enjoyed by many ages! As with the infographic, we’ve used our hand-painted illustrations from our children’s books to help bring it to life.